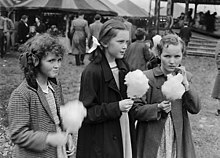 Calan Mai ([ˈkalan ˈmaɪ̯] "Calend (first day) of May") or Calan Haf ([ˈkalan ˈhaːv] "Calend of Summer") is a May Day holiday of Wales held on 1 May. Celebrations start on the evening before, known as May Eve, with bonfires; as with Calan Gaeaf or November 1, the night before (Welsh: Nos Galan Haf) is considered an Ysbrydnos or "spirit night" when spirits are out and about divination is possible. The tradition of lighting bonfires celebrating this occasion happened annually in South Wales until the middle of the 19th century. In Anglesey and Caernarfonshire it would be common on May Eve to have gware gwr gwyllt "playing straw man" or crogi gwr gwellt "hanging a straw man". A man who had lost his sweetheart to another man would make a man out of straw and put it somewhere in the vicinity of where the girl lived. The straw man represented her new sweetheart and had a note pinned to it. Often the situation led to a fight between the two men at the May Fair.